This is a superbly curved, left-handed tooth which is 6 3/8 inches around its curve, and 1 5/8 inches across its base. The full-rigged ship "E. B. Sutton", built in 1881, is shown carefully etched in black ink. She is shown getting ready to start the process of anchoring. There is just a hint of blue in the ocean, and you can see her battered and patched sails clearly. There is just enough negative space at the top to emphasize her rigging. At the bottom, in a yellow banner, is etched her name and the year she was built. [Please click on the picture for a larger view.] The back of the tooth is left unpolished, so you can feel its natural state. Choose, as an added option, a Sterling Silver display stand made specifically for this tooth, which allows you to remove the tooth for closer viewing, and replace it when you are done. Also available is a turned walnut wood stand. This is, of course, a legal tooth, registered with the U.S. Department of Commerce as #21-238.0002. It weighs 176.8 grams. 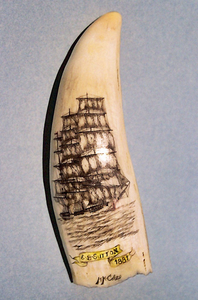 This is a marvelous classic piece that will be much appreciated by any scrimshaw collector.